Hayward has become Land of the Giants at Bell Plastics! In Hayward, Bell Plastics, located on National Avenue, is quite literally the Land of the Giants! Bell Plastics is a company specializing in custom plastic fabrication that has been around since 1979. But more than that, the owner Bruce Kennedy has a passion for giant fiberglass statues. 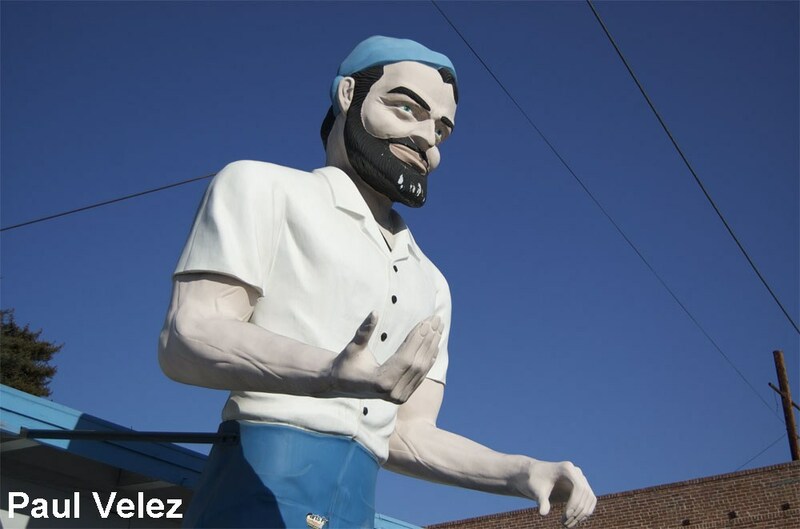 In recent years, starting with a Paul Bunyan Muffler Man that stood in Hayward, Bruce has collected: two Paul Bunyan Muffler Men, one Cowboy Muffler Man, one Happy Half Wit Muffler Man, one Uniroyal Girl, two Doggie Diner heads, one custom made Fireman Muffler Man, one Santa Claus, multiple dinosaurs, several fiberglass heads, and a variety of other giants and sculptures! Bruce's first acquisition was a Hayward native and was a Paul Bunyan style Muffler Man known as Big Mike. Big Mike had been in Hayward for decades. Starting in 1966, he was originally located on Mission Boulevard outside first Morris Car Wash, and later Tyre Treds, Big Mike during this phase of his life, carried a scrub brush. He eventually sadly suffered from vandalism, but was luckily rescued by Bruce Kennedy and Bell Plastics. Bruce purchased Big Mike in 2011. He was taken down for restorations from his location on Mission Boulevard on October 27th, 2011, and finally returned in new condition in March 2013 to the parking lot of Bell Plastics. Big Mike is generally all done up blue and white, but in October he dons a full on Halloween costume. His demon costume comes with a full length coat, a hatchet, and even his head is swapped out for a horned demon skull! Big Mike also has a large ax that was anonymously left for him on site, but it was sadly not quite the right size for the Muffler Man's hands. The base of real wood ax handle has the letters "BM" carved into it. The giant ax is on display inside the office foyer. By the summer of 2013 Big Mike acquired a friend, a fellow Muffler Man, this one a Cowboy version. This was Bruce's second Muffler Man acquisition. The Cowboy originally stood in Boonesville, Missouri at a Phillips 66 Gas Station, before he ended up in storage as a result of failed plans to have him stand outside a children's museum. Bruce Kennedy acquired him, had him transported across the country, fixed up, and repainted. He is now called Cowboy Don after Bruce's father. He is located in front of the business and can easily be seen day or night from the street. A few years after he was installed, Bruce installed a Doggie Diner head to his right. See below for more info on the Doggie Diner head. Both Big Mike and Cowboy Don have special Bell Plastics original bobble heads available for sale from the shop. But Bruce wasn't finished yet! 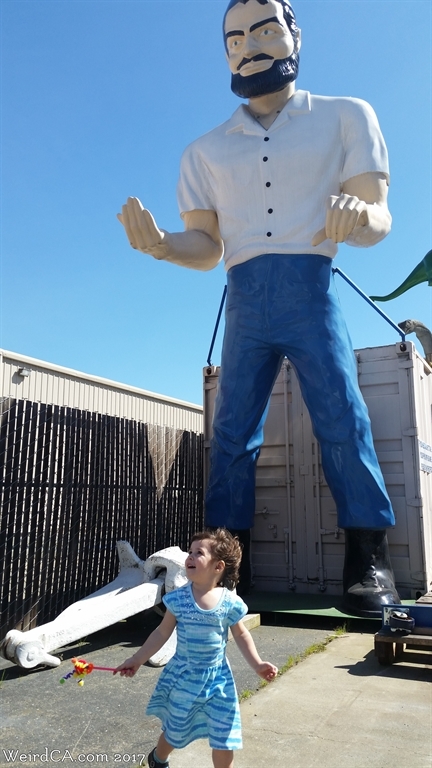 In November 2013, he acquired another Paul Bunyan Muffler Man! This one was hidden away in storage down in Paramount, California having been originally purchased from International Fiberglass in 1962. Bruce also acquired a 12 foot tall Santa Claus to go along with his Muffler Men from the same seller. Santa Claus was also made by International Fiberglass and purchased originally in 1961. The Paul Bunyan Muffler Man additionally came with a wood saw, wood hammer, and a fiberglass ax. Bruce has had the Santa Claus restored, but sadly the Paul Bunyan Muffler Man hasn't yet under gone restoration. His eyes are also whited out as well. As Bruce Kennedy is afraid that both axes might go missing after hours, they are generally kept in the office, only coming out for special occasions. If you thought three Muffler Men were enough, guess again. In early 2014, Bruce arranged to have a Happy Half Wit type of Muffler Man transported to Hayward. It is the only Happy Half Wit in California. Known for their straw hats and goofy Mad Magazine look alike grinning head, the Happy Half Wit Muffler Men are certainly on the rarer side of existing giants. Originally the Happy Half Wit started his career in Kansas City before in the late nineties relocating outside of Dort Mall in Flint, Michigan. There, he achieved a brief bit of fame by appearing in the 2008 movie "Semi Pro". Due to the Happy Half Wit's brief cameo appearance in the movie, Bruce refers to him as "Hollywood". He stands next to a shorter Fireman Muffler Man. The custom made Fireman arrived at Bell Plastics in March of 2016 and originated in Virginia. He is only fourteen feet tall and was not originally created by International Fiberglass. It was made by Mark Cline. In the first quarter of 2015, Bruce acquired an actual Doggie Diner head, from a chain of restaurants that had been in the Bay Area from the 1940s through the 1980s. The Doggie Diner head had been residing in storage south of Sacramento. Bruce also acquired the rotating mechanism that formerly allowed the head to rotate 360 degrees. If one Doggie Diner head isn't enough for you, Bruce acquired yet another one in late May 2015. This one was apparently sitting in a field up near Clear Lake and when the owner passed away the family discovered it and sold it to Bruce. There are several other Doggie Diner heads scattered throughout California, including one that is a city landmark in San Francisco. Bruce has had both Doggie Diner heads repainted and repaired. The paint job does look beautiful on each of them. One he has had installed to the right of the Cowboy Muffler Man complete with his rotating mechanism so that he can now rotate when Bruce wishes to turn him on. The day we visited, the wind had blown the Doggie to one side, causing it to partially rotate towards the Muffler Man. Mount Vernon, Illinois use to have a Uniroyal Girl, the female equivalent of the Muffler Men, on display in front of Stan the Tire Man. After sixty four years of operation, Stan the Tire Man closed on June 1st, 2015. Their Uniroyal Girl had been acquired in 1970 by the owner Stan Koziara. Bruce Kennedy purchased her on June 15th and had her taken down on June 19th. By the end of the summer, she was on display in Hayward. She is actually the second Uniroyal Girl in California with the other located in Pearsonville. Luckily, Illinois still has a Uniroyal Girl in Peoria. Stan also apparently had a Paul Bunyan Muffler Man as well. With the purchase of a Uniroyal Girl, Bruce is mostly just missing one of the International Fiberglass Indians. Bell Plastics has a Sinclair Dinosaur too! It's a small one sitting on a pole, proudly above many of the other fiberglass statues. Sinclair Dinosaurs, until recently, were extremely rare in California, but with the spread of more Sinclair Gas Stations, they have started becoming more common. As if two Paul Bunyan Muffler Men, one Cowboy Muffler Man, one Happy Half Wit Muffler Man, one Uniroyal Girl, one Santa Claus, and one Gas Guy weren't enough, Bruce has a few other fiberglass giants lying around Bell Plastics. For example in the main office an eight foot tall Indian warrior welcomes visitors. Apparently this was an Ebay purchase from someone in San Diego. There's also two separate dinosaurs, one a sauropod, the other some sort of carnivore. A partially painted Bob's Big Boy also hangs out on the property, although if you look close enough, you might notice the brass knuckles and earring he has. Other recent acquisitions include a giant chili pepper which Bell Plastics is proudly displaying at the end of a pole. 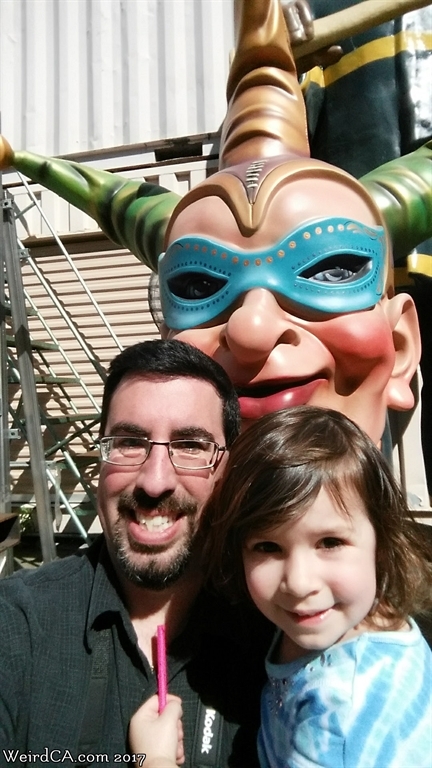 Several heads which appear to be interchangeable on several of the Muffler Men also exist on the property, one being a Frankenstein head, another an Uncle Sam, and finally a beautifully painted Jester's head in a Mardi Gras color scheme. As if all this wasn't enough, Bruce has several other items stashed at Bell Plastics. Items of note include Spider Man climbing down a container, a grinning Minion like canister shaped object, and a horned skull head that can fit on top of one of the Muffler Men. Still not enough? Maybe if you're lucky Bruce will give you a tour of his offices! Inside are all sorts of Asian artifacts, the majority of them safely protected in glass cases! Bell Plastics also makes Bobble-heads of Big Mike and Cowboy Don. Bruce informed me that he intended to add four additional bobble-heads to the line, probably adding bobble-heads of some of his other giants. Collect them all! On December 8th, 2014, a sixteen foot tall fiberglass service station attendant was acquired by Bruce Kennedy and was erected alongside the other Muffler Men. The service station attendant was referred to as Gas Guy. He wears all white. He was not built by International Fiberglass like the four Muffler Men were. He sadly was only on loan and is now no longer available to view. He is now on private property somewhere in the Bay Area. Bruce and his employees love visitors and will happily show you their Giants if you stop by and visit. Note they are only open weekdays, although Cowboy Don and one Doggie Diner head are accessible from the street, the rest of the fiberglass army resides behind a gate. Additionally, if you have old Muffler Men that need parts, it's possible Bruce and Bell Plastics will be able to fabricate missing parts for you. They have been able to take molds of some parts of their Muffler Men, and can create new replacement parts if necessary. They also have a line of different heads for your new Muffler Man, including Uncle Sam, a demon, and Frankenstein. Pictures on this page have so far come from three separate visits, one in 2/2014, a second in 6/2015 and a third on 3/2017. Additional photos came directly from Bruce Kennedy of Bell Plastics. 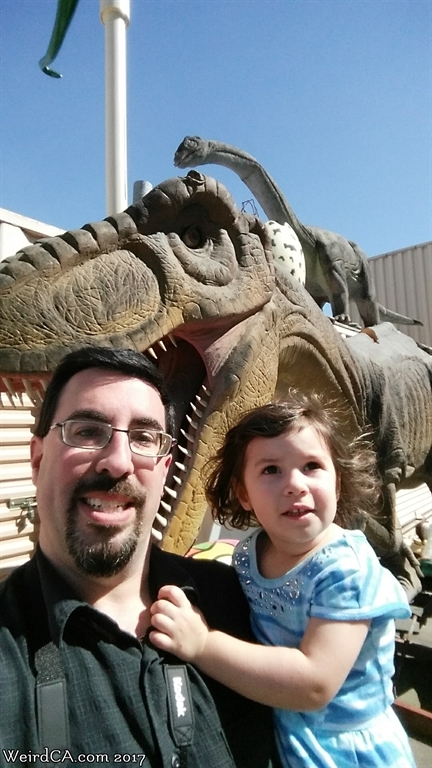 Special thanks to Bruce both for taking the time to show my daughter and I around, as well as keeping us updated with recent photos and information on the new attractions at Bell Plastics. It is appreciated! Tiffany taking her own pictures of all the awesome fiberglass statues! I am looking to buy a Paul Bunyan character. If you know where one is available, please email me. Thank you.